The old adage about necessity being the mother of invention is exemplified by the invention story for the Aqua Locator. Its chief inventor, Othmar W. Pies (William H. Middendorf and Carl F. Everet, Jr. were co-inventors), worked for years in public utilities serving the City of Cincinnati. Mr. Pies' duties included locating and maintaining water lines and meters. Accurate maps of underground utilities often were not created, were not maintained, or became useless because surface features changed. Mr. Pies tired of using trial and error to find underground utilities; existing devices and methods were unreliable and cumbersome. He understood the magnetic principles at work in a standard compass, and the location technology of the day – "dipping needles." Dipping needles customarily were used to locate underground objects, but suffered from a number of practical deficiencies. For example, dipping needles were prone to "needle spin," meaning that merely moving the device from place to place caused the pointing needle to rock back and forth rapidly. In addition, dipping needles suffered from an inherent ergonomic flaw: the needle face had a vertical orientation: the face was perpendicular to the ground, and the user could not comfortably view the needle's position while standing or walking. The Aqua Locator inventors utilized existing technologies, but eliminated their primary shortcomings. The heart of the Aqua Locator is a functional compass, but with many refinements to facilitate the device's intended use. Needle spin was essentially eliminated using proprietary damping methods. The Aqua Locator employs mirrors to provide a horizontal reading face for the user. Further, the Aqua Locator includes a carrying case and strap, which permit the user to take readings comfortably while standing or walking. Mr. Pies filed a patent application for the Aqua Locator on October 18, 1954, and Patent No. 2,775,736 was granted on December 25, 1956. The patent was assigned to a partnership (Aqua Survey & Instrument Company), and production of the Aqua Locator began in Cincinnati. From its inception, the Aqua Locator assembly process required hand craftsmanship and meticulous attention to detail, including precise calibration of every unit for its intended geographical destination before shipping. That old-world approach to craftsmanship, including most of the original tooling created for the Aqua Locator, continues to the present day even though ownership has changed and production facilities are now located in Cedarville, Ohio. The Aqua Locator requires little training to operate, uses no software (ergo no bugs, viruses, or upgrades), and does not require batteries. It operates in all temperatures, and comes with its own carrying case. In the era of ubiquitous electronics, the Aqua Locator's ingenuity and intelligent design still stand apart. "Over the years, we have sold thousands of these reliable magnetic locators to our customers. 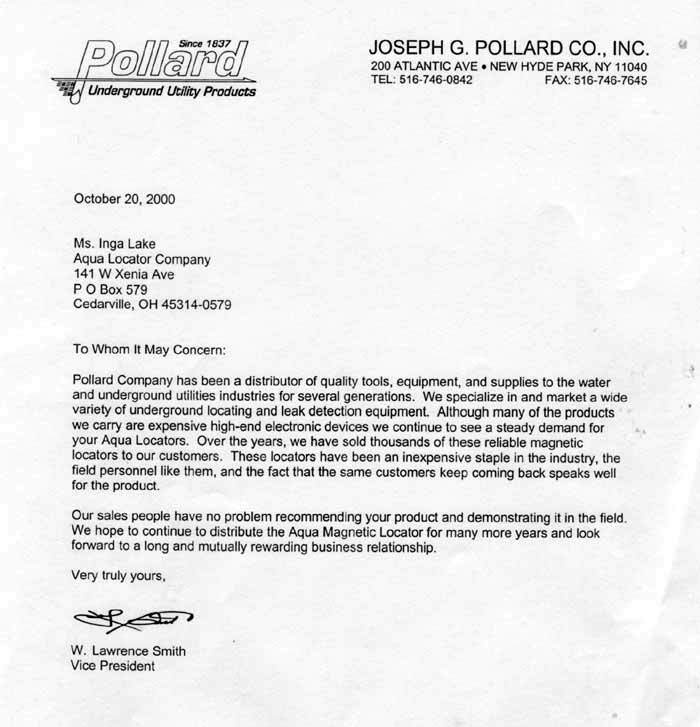 These locators have been an inexpensive staple in the industry..."
Joseph G. Pollard Co., Inc. Copyright © 2018 Somborn, LLC. All Rights Reserved.